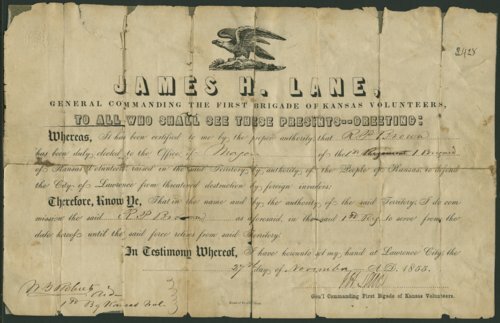 This certificate issued by James H. Lane, General Commander of the First Brigade of the Kansas Volunteers, gives the proper authority to Reese P. Brown to serve as Major to defend Lawrence, Kansas Territory, from foreign invaders. Brown, a member-elect of the Topeka Legislature, was killed January 17, 1856 by a pro-slavery mob at Leavenworth. Call Number: Misc.Collection., Box Bro Folder Brown, R. P.